We just purchased a 1999 Polaris Pro 785 after reading all the good posts here on the site. What a great resource for PWC owners. We are use to our Ultra 150, so maybe we're just not used to the Pro. Here are a list of potential "symptoms", but not sure if they are just characteristics of the Pro? 1. Smoke coming out of the front hull, possible exhaust leak from the blue hosing and/or seals? Cannot locate exact location of leak, but is from the front. Lift the seat and watch out... will continued use ruin the engine? 2. Very slow out of the hole. Takes a while to get on plane. Would only run at 2500 WOT for a while, but if I stand up on the back it helps. Then after 10 seconds at this low rpm (even though I had it WOT), it takes off. Revs up to about 6000, but that is it. Possible bad plugs or clogged fuel line? 3. Very loud chatter. Sounds like something is broken. I watched a video posted on this site with someone riding one around. The sound was similar. Could it be the exhuast valves rattling? 4. I read about this thing being super fast off the line... this one bogs quite a bit before it takes off. Max speed on speedo was 40 mph around 6000 rpms. Isn't the top speed closer to 55 / 8000 rpms? Hopefully, someone can provide some assistance. Wanted a quick inland lake ski to buzz around in, but so far it isn't what everyone is raving about. Last edited by eye4speed; 07-29-2007 at 05:31 PM. Your top speed problem is the broken hose on the exhaust. I had a 99 that split a hose and had the same problem, lost the high RPM and top speed. Need to find the leak and replace the hose and you will like the results. The main culprit is the hose that goes from where the three pipes gather to the other exhaust thing. 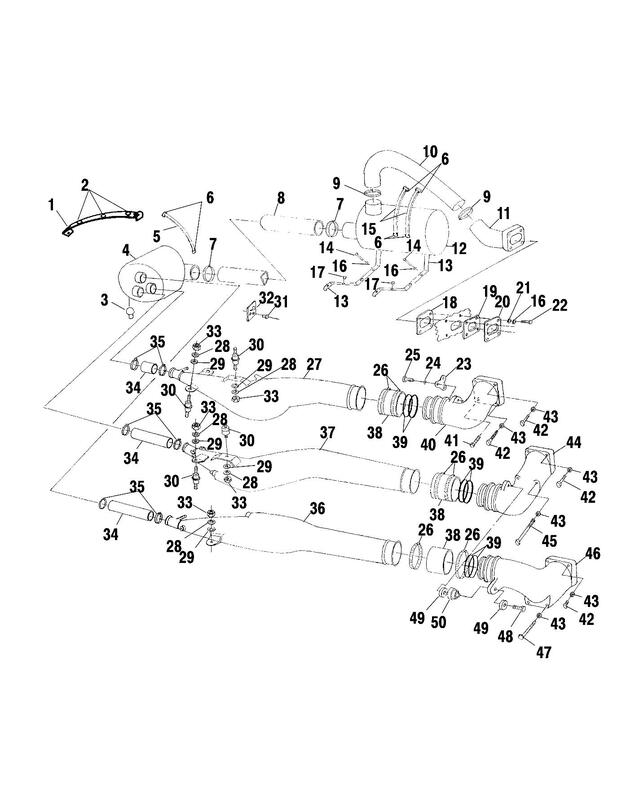 On an exhaust drawing, I think it is part number 34, surrounded by the two hose clamps numbers 35. The previous owner replaced it with metal flex hose and two rubber gaskets. Seems that the rubber gaskets cracked. Is the OEM hose the blue material or some other hi-temp rubber? Does anyone know the ID of the hose? We purchased some spa hose (jacuzzi) and it has an ID of 1.5"? It is too small. I would guess the OEM part is 1.75"? If you haven't guessed, we are not too mechanically inclined. Sorry for the non-technical descriptions. Last edited by eye4speed; 07-29-2007 at 10:08 AM. You need high temp silicone hose 1 3/4 ID. I think the part that is leaking #34, not #8. It is only about 9" long. I guess I can't read the diagram right. Thanks Chris for helping out! Normal. Once you get the exhaust problem (and whatever other gremlins await you) the "chatter is only at idle, or while letting off the throttle. All other times, it sounds like a banshee gone berserk. Have you done a compression check yet? The Pro has a tendency to eat pistons when not treated with tender loving care, and at least 91 octane. DONT ride that thing with that exhaust leak!!! lol. We didn't ride it - like last weekend, but we did look inside. The #34 hose is definitely leaking - black liquid stuff is coming out and dripping on the other hoses below it. Good looking out Chris. Hopefully it will be a quick fix - thanks Bdart for the advice on the hi-temp hose - a lot cheaper than OEM. We checked compression and all three cylinders were at 120. Fingers crossed that the new hose fixes the problem. Last edited by eye4speed; 07-29-2007 at 05:33 PM.